The Yellow-legged Weaver was collected and formally described by James Paul Chapin, an American ornithologist. Chapin is one of the highest-regarded ornithologists of the twentieth century. Chapin and Herbert Lang led an expedition to conduct a biological survey of the Belgian Congo between 1909 and 1915. Chapin published many papers with new bird species descriptions, and eventually summarised all bird data in several volumes, "The Birds of the Belgian Congo". Chapin was based at Avakubi for much of his time in DRCongo, but only in 1913 one of his hunters brought him a single specimen of the Yellow-legged Weaver from the forest. The female specimen contained small caterpillars in the stomach. Several more specimens were collected over the next few decades, but only in 1960 was the first adult male specimen described. Chapin included a line drawing of the head, bill and leg of the Yellow-legged Weaver type. The Yellow-legged Weaver was first fully illustrated by Mackworth 1973a. 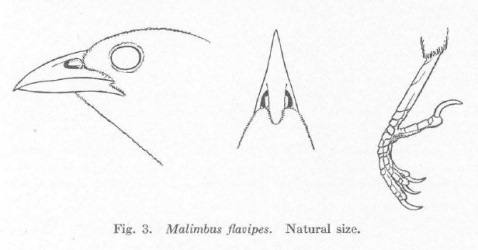 Malimbus flavipes	Chapin 1916a,	Bull. Am. Mus. Nat. Hist. 35 p.27,	Avakubi, Zaire. flavipes, Latin: flavus, golden-yellow; pes, the foot. 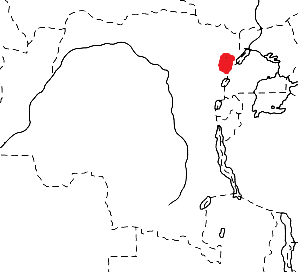 Avakubi, Ituri District, Belgian Congo. The type is in the American Museum of Natural History (AMNH 162602). Identification. The Yellow-legged Weaver is black with distinctive dull yellow legs and feet. There is some green gloss on the tips of the feathers of the crown, back and breast giving a slightly scaly effect - these areas are wholly black in Vieillot's Black Weaver and Maxwell's Black Weaver. The belly and undertail-coverts of the Yellow-legged Weaver are dark brown, and the sexes are similar. Distribution. 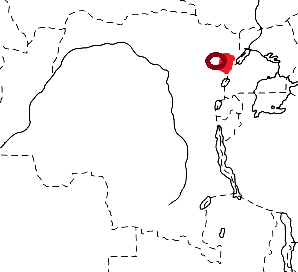 The Yellow-legged Weaver is restricted to lowland forest in eastern DR Congo (see map below, based on Birds of Africa). Only 9 specimens are known, the last from 1959; two sight records from Okapi Faunal Reserve (1990 and 1994). There are no subspecies. The Yellow-legged Weaver is rare, and very poorly known. It has been suggested that it could represent occasional hybrids, but recent DNA work suggests that it is a valid species (presented at the 2012 PAOC). Habitat. The Yellow-legged Weaver inhabits the canopy of dense lowland forest. Food. The Yellow-legged Weaver probably feeds on insects, and small caterpillars have been recorded in its diet. Breeding. Nothing is known about breeding in the Yellow-legged Weaver.